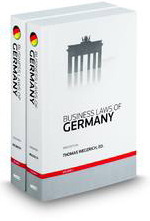 Written by a widely recognized expert panel from premier German and international law fi rms, this title explains key issues and pitfalls arising from clients‘ transactions in Germany. It helps the reader gain a better understanding of what actions need to be taken and possible outcomes of those actions. This softbound twovolume work is updated annually. Dieser Beitrag wurde unter Titel abgelegt am Sonntag, 05UTCSun, 05 May 2013 14:06:00 +0000 5. Mai 2013 von admin.